There has been a lot of 90’s nostalgia over the last few years, primarily for music. Bands such as Neutral Milk Hotel, My Bloody Valentine and Pulp have played very successful comeback shows, fuelled by fans wanting to revisit their former years. This nostalgia has crept into TV and film with Twin Peaks and now possibly X Files getting reboots in the coming years, we can’t get enough of looking back. One of the more successful and slightly surprising products of this nostalgia is the Fargo TV series. Taking fan fiction to the max, using the essence of the film than taking it literally, the TV series brought something new that fans could enjoy. With outstanding performances throughout the show makers have created one of the most memorable and loved series of 2014. Kumiko The Treasure Hunter attacks the nostalgia for Fargo from a different angle, focusing on the story of a young Japanese lady who after discovering the film, becomes obsessed with the scene where Steve Buscemi’s character hides a suitcase of money. Though it’s release is not likely intended to cash in on the Fargo series success, it seems fitting with the current awareness of the subject, for this film to be released at this point in time. 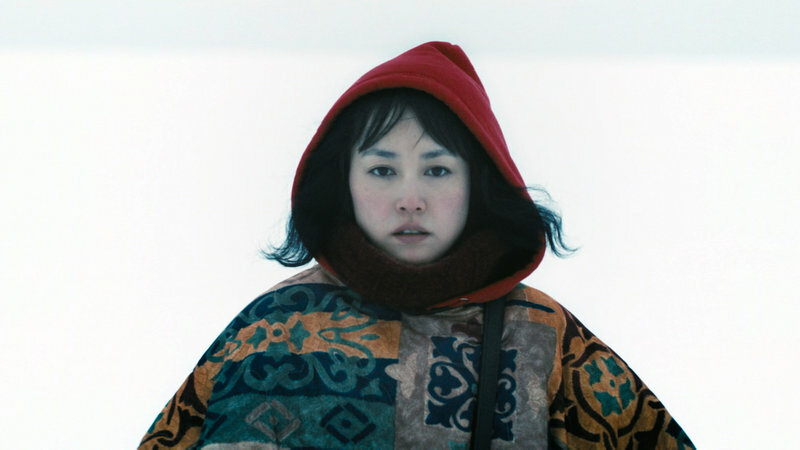 Kumiko (Rinko Kikuchi; Pacific Rim, Norwegian Wood) is a loner, she hates her job and avoids her friends and family, preferring to spend time with her rabbit Bunzo. After discovering a video of Fargo, she becomes obsessed with going to Fargo to unearth the suitcase of money. So she packs up, leaving her life behind to undertake the journey to the cold wilderness of North Dakota to seek her treasure. The cinematography in combination with the score by The Octopus Project is flawless. With every shot well thought-out, it’s a very beautiful film to watch and digest and has some well-placed humour to keep the pace throughout. Rinko Kikuchi is stunning in the film and plays the character with sensitivity. Unlike Fargo, Kumiko The Treasure Hunter is actually based on a true story, well the legend of the true story of Takako Konishi. Konishi’s story was told in the documentary This is A True Story (watch online here… http://vimeo.com/66512803 though maybe avoid if you don’t want spoilers) in 2003 by Paul Berczeller. Konishi did travel to Fargo but the reasoning behind it, if it involved a treasure quest is unclear, and may have been misinterpreted due to a fragmented conversation between Konishi and a local police officer. Kumiko The Treasure Hunter has taken license with Konishi’s story, telling the fable rather than the slightly less baffling truth, the captivating and fantastical than the reality of the situation. In my opinion the story could have been more interesting if it had intertwined the myth and the reality, in a way that could have shown the differences. So as to show the changes that hearsay and misunderstood conversations can leave to the fabrication of these fantastical stories. When I found out this was based on a true story, for a moment it changed my interpretation of the film. I initially rejected it, thinking that writers David and Nathan Zellner chose to embellish the fabrication of the legend for their own return, to tell a story that makes a more entertaining movie. But then I thought some more, considered that their depiction of Kumiko is sensitive and never patronizing or mocking, it is beautiful and compelling, funny and sad. Maybe this is a better way for Konishi’s story to be told and released to the world than the reality?